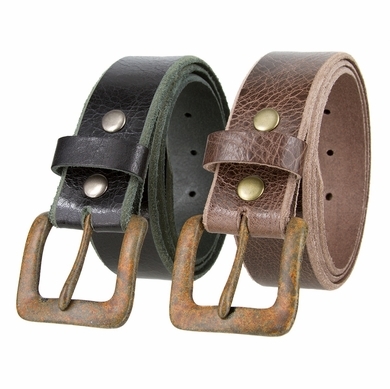 1 1/2" = 38mm Wide vintage rusty color finish buckle with genuine full grain leather belt. Comes in different colors such as black and brown. 7 Holes for easy fit adjustment and one matching loop. Perfect belt for a visit to a small town, ranch, old town, rustic places, or for your favorite costume outfit.